After more than 20 years at Dark Horse, the Star Wars franchise will be moving to Marvel Comics in 2015. 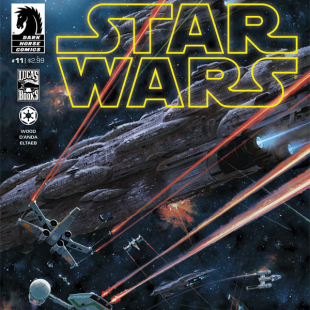 In 1991 Dark Horse Comics took over the Star Wars license and, for more than 20 years, has been the home for readers looking to add a bit of Force to their comic hobby. Many suspected, however, that that might change when Disney, the owner of Marvel Comics, bought Lucasfilm and Star Wars at the tail end of 2012. Today, it's now been confirmed that 2014 will be the last year that Dark Horse will publish Star Wars comics and that Marvel will be taking over in 2015. "Dark Horse Comics published exceptional Star Wars comics for over 20 years, and we will always be grateful for their enormous contributions to the mythos, and the terrific partnership that we had," said Carol Roeder, director of Lucasfilm franchise publishing. "In 2015, the cosmic adventures of Luke, Han, Leia, and Chewbacca will make the lightspeed jump back to Marvel, to begin a new age of adventures within the Star Wars universe." The staff at Marvel, in turn, is understandably excited to be regaining access to one of the world's most popular franchises, which it originally published in comic form back in 1977. "The perennial brand of Star Wars is one of the most iconic in entertainment history," said Marvel publisher/president Dan Buckley. "We are honored to have the opportunity to bring our creative talent pool to continue, and expand Star Wars into galaxies far, far away." Perhaps the biggest question that rises out of this perhaps not unexpected shift, is what will happen to current ongoing Star Wars titles. Just personally, I love what Brian Wood has been doing with his recent Star Wars series and I would hate to see it cut short. It's possible that I might not even have anything to worry about. Buckley said in his statements that Marvel will "continue the publication of Star Wars comic books and graphic novels" after it takes over in 2015. That said, that's still vague and there's no telling if the company will continue with ongoing series, or start up with a fresh batch of its own.